A DNA strand can act as a template for synthesis of a new nucleic acid strand in which each base forms a hydrogen-bonded pair with one on the template strand (G with C, A with T, or A with U for RNA molecules). The new sequence is thus complementary to the template strand. The copying of DNA molecules to produce more DNA is known as DNA Replication. DNA replication takes place at a Y-shaped structure called a replication fork. A self-correcting DNA polymerase enzyme catalyzes nucleotide polymerization in a 5ʹ-to-3ʹ direction, copying a DNA template strand with remarkable fidelity. Since the two strands of a DNA double helix are antiparallel, this 5ʹ-to-3ʹ DNA synthesis can take place continuously on only one of the strands at a replication fork (the leading strand). On the lagging strand, short DNA fragments must be made by a “backstitching” process. Because the self-correcting DNA polymerase cannot start a new chain, these lagging-strand DNA fragments are primed by short RNA primer molecules that are subsequently erased and replaced with DNA. DNA topoisomerases to help to relieve helical winding and DNA tangling problems. Many of these proteins associate with each other at a replication fork to form a highly efficient “replication machine,” through which the activities and spatial movements of the individual components are coordinated. Each strand in a parental duplex DNA acts as a template for synthesis of a daughter strand and remains basepaired to the new strand, forming a daughter duplex (semiconservative mechanism). New strands are formed in the 5′ to 3′ direction. Replication begins at a sequence called an origin. Each eukaryotic chromosomal DNA molecule contains multiple replication origins. DNA polymerases, unlike RNA polymerases, cannot unwind the strands of duplex DNA and cannot initiate synthesis of new strands complementary to the template strands. Helicases use energy from ATP hydrolysis to separate the parental (template) DNA strands. Primase synthesizes a short RNA primer, which remains base-paired to the template DNA. This initially is extended at the 3′ end by DNA polymerase α (Pol α), resulting in a short (5′ )RNA- (3′)DNA daughter strand. Most of the DNA in eukaryotic cells is synthesized by Pol ẟ, which takes over from Pol α and continues elongation of the daughter strand in the 5′ to 3’direction. encircles the daughter duplex DNA. 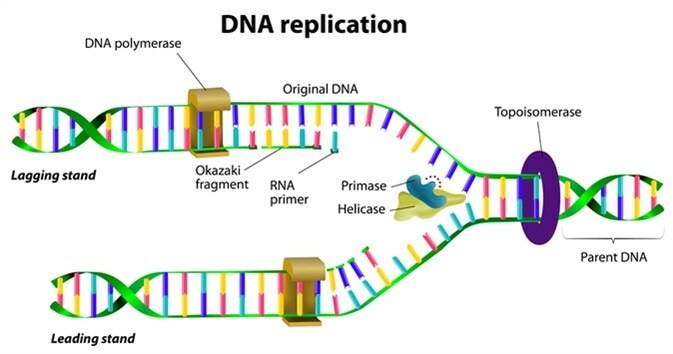 DNA replication generally occurs by a bidirectional mechanism in which two replication forks form at an origin and move in opposite directions, with both template strands being copied at each fork. Synthesis of eukaryotic DNA in vivo is regulated by controlling the activity of the MCM helicases that initiate DNA replication at multiple origins spaced along chromosomal DNA. At a replication fork, one daughter strand (the leading strand) is elongated continuously. The other daughter strand (the lagging strand) is formed as a series of discontinuous Okazaki fragments from primers synthesized every few hundred nucleotides. The ribonucleotides at the 5′ end of each Okazaki fragment are removed and replaced by elongation of the 3′ end of the next Okazaki fragment. Finally, adjacent Okazaki fragments are joined by DNA ligase.